The Streatham & Brixton Chess Blog: Every Picture Tells A Story: Hereford Ho! Every Picture Tells A Story: Hereford Ho! Blog 5 in a series of collaborative posts. This one by Martin Smith, with comments by Richard Tillett. In our last episode Richard didn’t buy a painting of the gentlemen chessers of Hereford that probably wasn’t by Thomas Leeming. This time the Institute of Thomas Leeming Studies is off on its first field trip. We are going to Hereford City Art Gallery to see their version of the picture which, we are confident, is definitely by the man himself. As we explained in an earlier blog, we discovered the existence of this painting while trying to trace the whereabouts of the “Greenlees” version. Yes, it is all a bit confusing and we get them muddled up too. En route Richard muses on what might have been at the Christie’s auction a week or so before, and how he is now rather relieved that he didn’t shell out £2k+ on a picture that wasn’t, to borrow a phrase our Thomas might have used, up to snuff. With a bit of time to spare before our appointment with Catherine Willson at the Gallery we check out the Cathedral. We hope we might chance upon Leeming’s 1816 portrait of the Reverend J. Russell, who was sometime Canon there. We knew about this picture from our research at the Royal Academy, but didn’t know its current whereabouts. Leeming, we had established, was primarily a portrait miniaturist who exhibited over twenty works in the RA Summer Exhibitions in the ten or so years up to 1822, when he suddenly stopped. We hope we might one day get to the bottom of this seemingly abrupt end to his career. 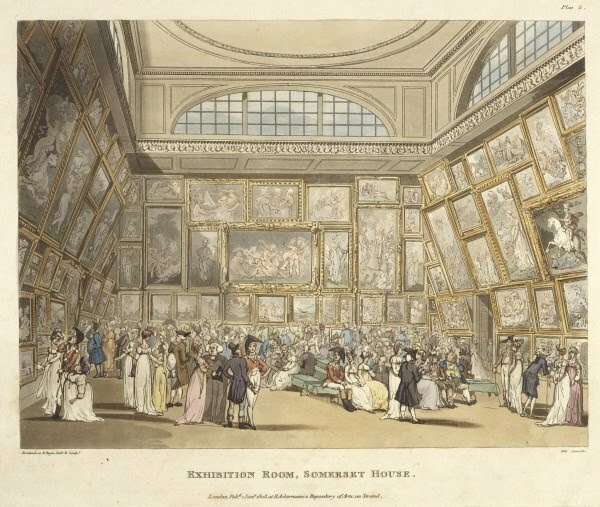 A Royal Academy exhibition at Somerset House in 1800, by Thomas Rowlandson and Augustus Charles Pugin. The Reverend Russell declines to reveal himself, and we press on to the Gallery where Catherine welcomes us. Eagerly we go to the picture store to see the Gents picture, and very fine it looks too, knocking the Christie’s version into a cocked hat, to borrow yet another phrase that Thomas might have used. We show Catherine our reproductions of the “Greenlees” version and the Christie’s curiosity. Even if two of the images were only print-outs, maybe it is the first time all three have been together in one room. Anywhere. Ever. A small bit of History is made. In-store at Hereford Art Gallery. Reproduced by kind permission of Hereford Museum and Art Gallery. Although it’s a bit dark and maybe could do with a clean, the Hereford version shows clarity, confidence, and skill. No iffy hands, dodgy perspective or wobbly niches here. It is seven miniature portraits, eight if you include the dog, arranged to show off everyone at their best. The picture over the fire-place catches our eye. It appears in the “Greenlees” version as well. It’s a view of the Cathedral, with Hereford’s very own Nelson’s Column in the foreground. The Column was erected in 1809 as a local monument to the hero of Trafalgar but the money ran out and they never got to put a Nelson on top. So the great man is represented by an, ahem, urn. The cathedral, with Hereford’s Nelson-less Column in the foreground. (The real thing is a bit clearer than this). But is this a miniature copy of a real painting we wonder, or did Leeming cook it up for the occasion? 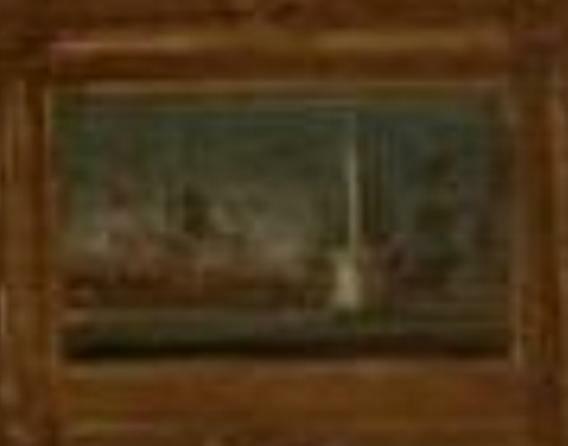 Another little mystery to solve, along with a bigger one: if that’s a “portrait” of a real room, where was it? Now comes the best bit. Catherine says that the Gallery had the picture re-lined sometime after acquiring it in the 1940s and had the foresight to photograph the original lining on the back of the picture before it was destroyed. The back of the picture before it was relined....almost as interesting as the front. Photo courtesy of Hereford Art Gallery. It’s a revelation. 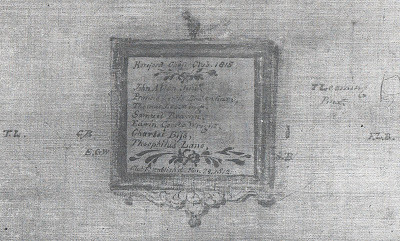 Not only can we see a list of the sitters (in what we have since satisfied ourselves is the artist’s own handwriting), we are also able to confirm their positions in the composition, the date of the painting (1815), and that it was indeed painted by Leeming (we know that from the “Pinxt” after his name). The picture has a simple title, “Hereford Chess Club”, in contrast to the “Greenlees” title which is more expansive “Portraits of the Gentlemen of the Hereford Chess Society”. There is also the fascinating snippet of information that Hereford Chess Club was established on the 29 November 1812. So this is more than just an interesting picture – it’s a piece of chess history. Here is documentation of the date of formation of what may be one of the earliest chess clubs in the land. We wonder if the gents at the present day Hereford Chess Club know that they have a bicentennial coming up in 2012. Thomas Leeming, you rascal – what have you got us into? Now we have to investigate the origin of chess clubs. That’s along with unearthing the biographical dates of the artist himself, and solving the riddles of why he stopped painting in 1822 and why he painted this picture at least twice. We also have to track down the “Greenlees” version, locate the room, tell the stories of the people in the painting and the pictures on the walls and find out who owned them. Questions, questions, and more questions! The Institute of Thomas Leeming Studies has a rosy future. 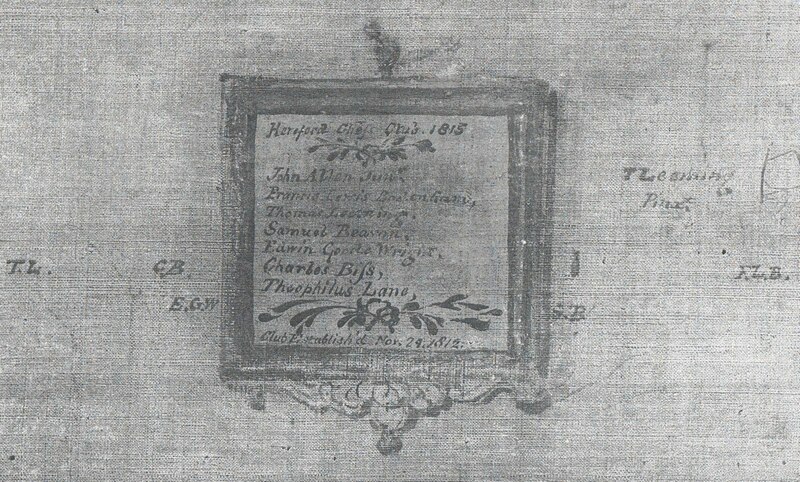 But there is something else stuck on the back: a label from the art dealers Agnew’s, who sold the picture to the Gallery. It has what looks like a stock number that could be a lead to who owned the picture before it came to the Hereford gallery. Richard will follow this up back in London. Surely this is enough excitement in one day for two London chessers far away from home. But no! Your intrepid bloggers call in at the local library to look at the volumes of the Hereford Journal dating back to the time when the pictures were painted. 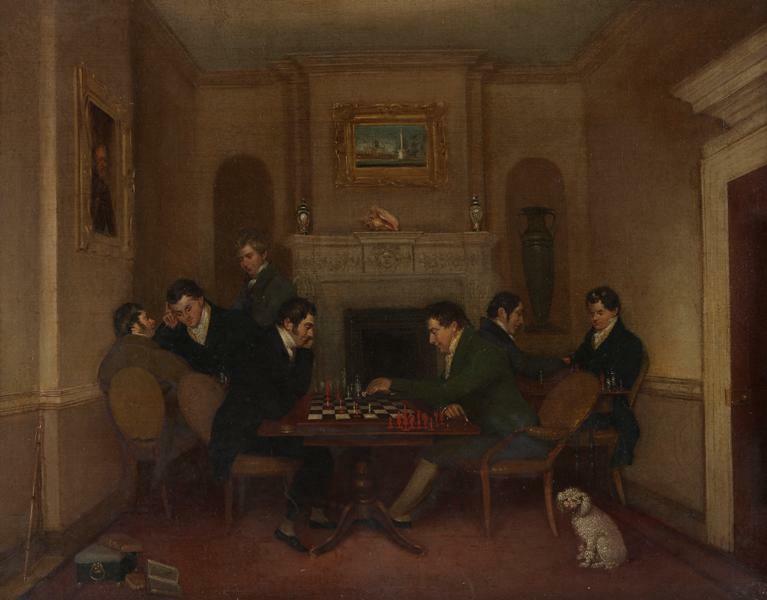 Edwin Goode Wright, the player in the foreground making the move, was its editor – surely he’d have reported the chess club and its formation as he was there when it happened. Alas, a quick search reveals nothing about the inauguration of the Chess Club, nor the painting, nor anything about Thomas Leeming. Then, as now, chess wasn't news. ...where we find a reference to Thomas Leeming’s marriage to Mary Link on the 22 April 1817 in the parish church of Hereford, St. Peter’s. Is this the first step in reconstructing the biography of our artist, and putting some flesh back on his bones? And so back to London, with a long To Do List and a pesky parking ticket. Read about the next leg of our adventure on the 26th February. Thanks again to Catherine Willson, Collections Officer: Fine and Decorative Arts, Hereford Heritage Services. 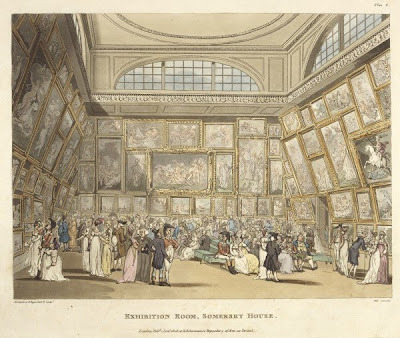 Royal Academy for the Rowlandson. Herefordshire Council for the view across Castle Green. And what exactly did our Ms. Wilson think of two chessing art-buffs pitching up to grill her about some old painting? I think we should be told! She took it in her stride, Jonathan! Catherine has been really interested in what we're doing and incredibly helpful. In fact everyone we've spoken to in Hereford about the Leeming saga - Art Gallery, Library, Records Office, Chess Club, local historians and, most recently, Cathedral Archive, have engaged with what we're doing. The "one thing leads to another" quality of the saga is in no small measure due to them. There’s more to come! Great to hear from the stalwarts of today's Hereford and Worcester chess. I've been reading this series for about a week now. As this is Nov., 2012, I find it fortuitous that I've discovered this amazing story on the Centennial year of the Hereford Club's establishment. I have a long way to go in this saga and I'm anticipating the remainder whetted by the savory taste of the previous. Thanks for the wonderful chessic detective tale.